Randall Lyons, Ed Lofgren, Larry Russo, and MMTA president Adam Cooper, who also serves as GM for Russo MarineMax. FOXBOROUGH, Mass. — The most important thing to employees is not what supervisors think, and that is part of the reason managers have a hard time attracting and training talent. That’s according to Jim Million, one of many speakers at the Massachusetts Marine Trade Association conference on Thursday, who said that employees want to be appreciated for a job well done. “As a leader, you have to give your people reason to do something,” said Million. Sen. Don Humason Jr. was presented with the Legislator of the Year Award for helping the industry receive $100,000 for workforce training and development. He encouraged attendees to reach out to members of Congress to start a conversation with them. “He is the reason we got $100,000 for workforce development, and he’s the reason we have bipartisan support,” said Jamy Buchanan Madeja, Esq., MMTA&apos;s legal and government relations council. 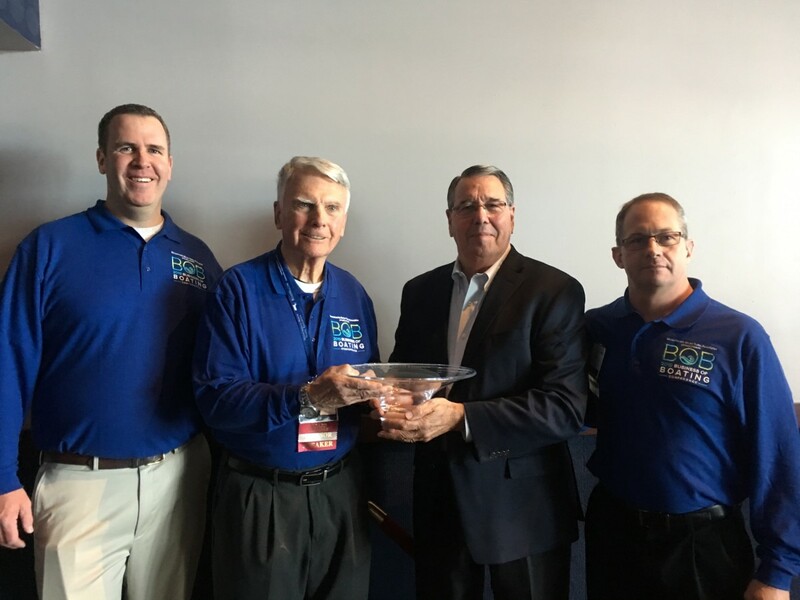 Ed Lofgren of 3A Marine Center was given the Frank Farrell Award for his “tireless commitment to workforce development” since joining the industry in 1964, said Larry Russo of Russo MarineMax in introducing the award. Lofgren recalled the year he opened his marine dealership — he was a teacher by day and sold boats at night. Lofgren also spoke about the New Bedford Votech program that the MMTA Educational Trust hopes to duplicate across the state. The MMTA Educational Trust is providing education and training, and offering scholarships to those that need assistance, said Lofgren. Keynote speaker and American Boat & Yacht Council president John Adey gave a brief state-of-the-industry address. Adey moderated a panel discussion with ABYC education vice president Ed Sherman, Lofgren, and NEIT education and training vice president Steve Kitchin that also focused on workforce development. There is also a growing teacher shortage, particularly in STEM classes, said Kitchin. To address that, ABYC is launching a “Train the Trainer” program in Annapolis this summer to help train instructors, said Sherman. Sherman says the Train the Trainer concept would be a multi-day course. “We want to teach not only how to become a better teacher, but also provide some technical content that would get teachers up to date with the latest that’s going on, and give a snapshot into what they need to do better,” he said.